...the voyage was more disastrous for those documents than had been the taking of Nineveh by the Medes. What ended up in London in a pile of dust were the broken fragments of the most valuable history of Mesopotamia. This had been the library of King Ashurbanipal (668-626 BC) who collected meticulously and stored carefully his collected treasure trove. I study stone inscriptions from before the flood, which are obtuse, obscure and confused. The ancient East has risen as it were, from the dead, with its politics, and its wars, its laws and its trade, its arts, its industries and its science. Genesis is too specific in detailing the culture of Adam's day to allow us to propel him back in time so that Adam can be ancestral to everyone on earth. Also, the genealogies in Genesis 5 and 11 are a prohibitive factor showing a connected line of patriarchs from Adam to Abraham, who is dated to roughly 2000 BC. But even if we could slide Adam back over a hundred thousands years so that he could start the Homo sapiens species, or even one of the races, there is no place in the history of hominids where Adam could have commenced his line of descendants in isolation, absent any other type of human beings. Even at 100,000 years ago, Neanderthals occupied northern Europe. Both archaic Homo sapiens and Neanderthals make their appearance earlier than what are considered to be truly modern Homo sapiens, and they continued for tens f thousands of years after that. 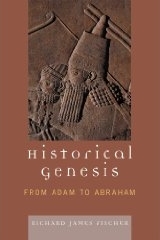 If Adam lived in the Neolithic Period as indicated by Genesis, then Adam entered a populated world.